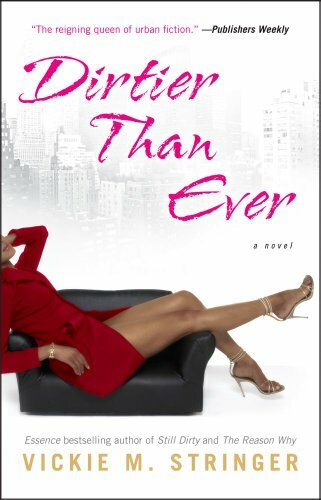 Following the phenomenal success of Essence bestsellers Dirty Red and Still Dirty, Vickie M. Stringer takes readers on another bumpy ride in Dirtier Than Ever with Red, Bacon, and Q—the crazy love-hate triangle who makes the series a favorite among urban fiction fans. Q wished that Bacon had killed Red when he had the chance. Red knew that Q’s career as a hustler was over and he was counting on starting a new legit business with the money he had made. He had once believed her when she promised that the money didn’t mean a thing and she would give it all up to be with him. Bacon returns from prison and suddenly Q is left for dead. With Q out of the picture, Bacon now has Red to himself. His sights are set on being the top hustler with Red by his side. He believes Red has fi nally changed when she reveals the truth about her past. money on her mind, Red must make a decision . . . does she turn over a new leaf or revisit her dirty ways of old? Gritty, steamy, and intense, Stringer delivers another page-turning caper about a hustler in high heels who is Dirtier Than Ever.